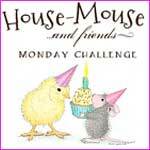 Hos Dorte: HM&FMC and Stampendous Blog Hop. Så søtt kort du har laget! Love your cute Gruffie image Dot, such a great way to use the Stencil goes so well with this winter card great work. Beautifully done Dorte...a fabulous image to go with this stencil!!! Have a great day Dot! What a lovely way to use this fabulous stencil. Super adorable make with that perfectly glammed up snow and that added glitter too. Gorgeous work teamie. A fabulous way to use the stencil and an icy sparkle to this snow bear! Great card! Love your stenciling! Thanks for joining us at Chocolate, Coffee & Cards! 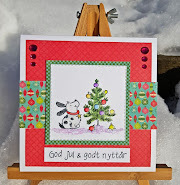 A fabulous card Dorte, such a fun image and your 'snow' is brilliant. You can't beat a bit of sparkle and what a great way to use this stencil too,thanks for sharing. What a fun card and I love how you made the snow with your stencil. Hi Dorte, Lovely wintery themed card, great stenciling love the glitter! Dorte, LOVE your card. The Gruffie stamp is adorable, and colored up beautifully. And the snowy glittery background you created with the stencil is awesome, even if it took some practice, it turned out great! Love the stenciled background; adorable image and card. I like how you used the stencil, it looks great together! Beautiful card Dorte! Glad you persevered with the stencil & embossing paste - it looks fab...especially with the glitter! Beautiful card and great how you used the stencil. Fab card and such a creative way to use the stencil. Love all the glitter. Pretty card Claudia. I love that brilliant shade of blue and the little wood embellies.